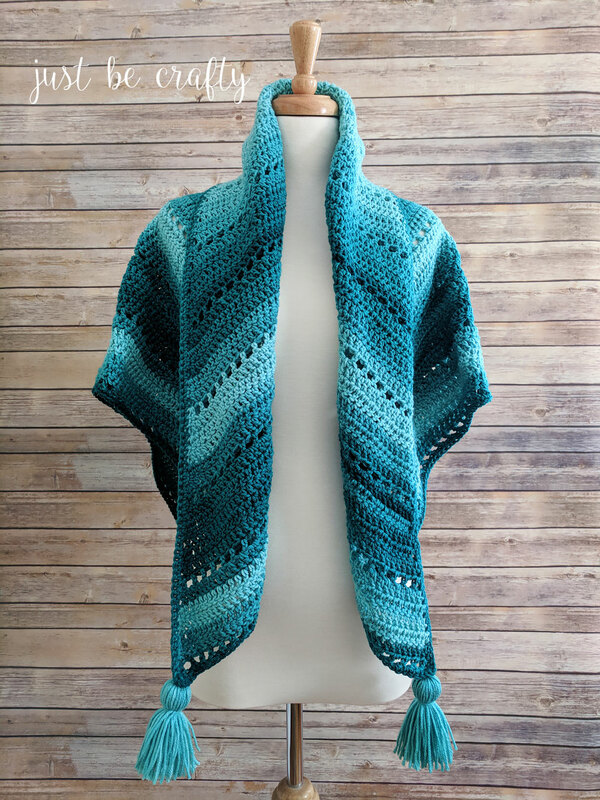 The Crochet Triangle Shawl is the perfect project to make as we transition into Spring. It’ll keep you warm when you feel a chill, but light enough to catch a nice warm breeze! 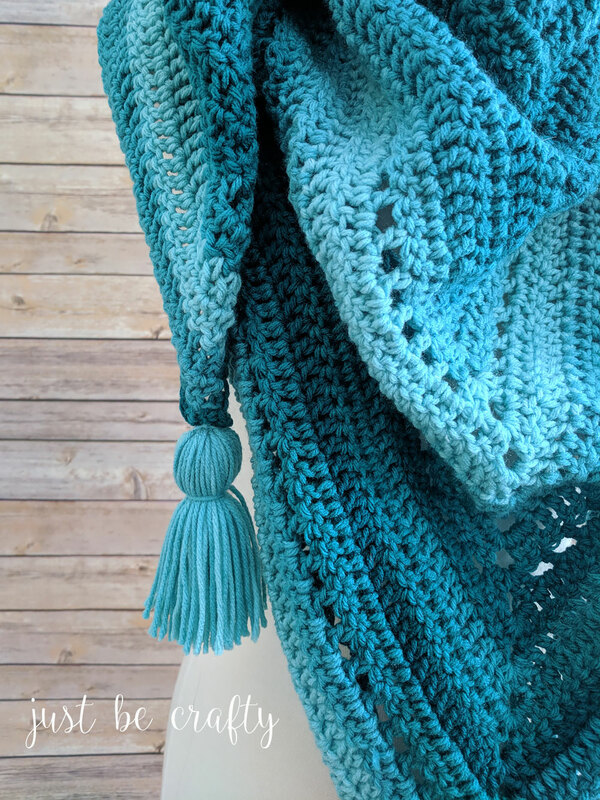 Today I am sharing the Crochet Triangle Shawl [with tassels!] Pattern! 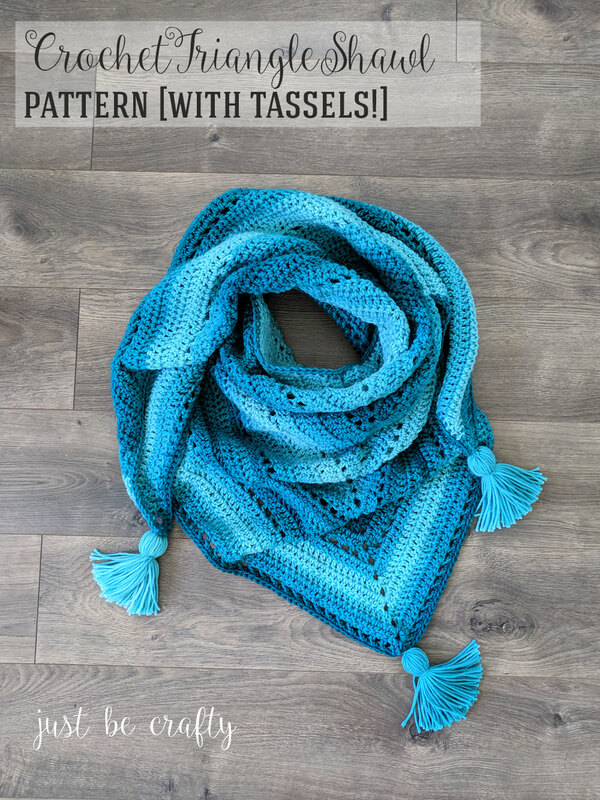 This simple and affordable project has the potential to be one of my top wardrobe staples as we transition from winter into spring and I think if you give it a try it will be one of your staples too! 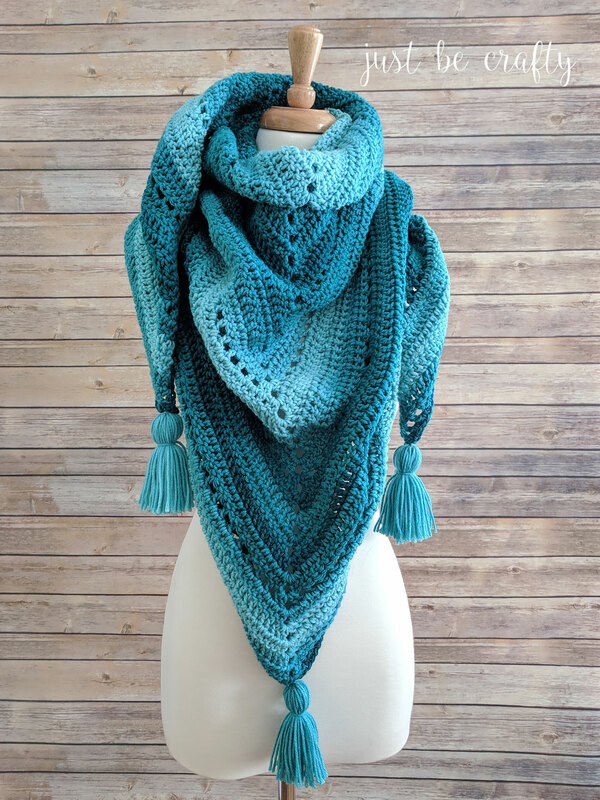 Shawls are perfect for this time of year as you can easily wrap yourself up when you feel a chill and loosen it up a bit to fall around your arms and shoulders if you get too hot. If you’d like to give this pattern a try for yourself, keep on scrolling! For a larger size, purchase additional skeins and complete repeats until you reach your your desired fit. For a smaller size, make less repeats than what the pattern calls for. Make repeats until you reach your desired fit. The starting ch 3 of each row will count as a stitch, unless otherwise noted. You will be working back and forth in rows. Row 6: Ch 3, dc in same st as ch 3, ch 1, sk a st, *dc, ch1, sk a st; repeat from * until you reach ch 2 sp (you should end w/ a ch 1, sk a stitch when you arrive at the ch 2 sp); 2 dc, ch 2, 2 dc in ch 2 sp, ch 1, sk a st, * dc, ch 1, sk a st; repeat from * to end of row, make 2 dc in 3rd ch of ch 3 from previous row; turn. Row 7: Ch 3, dc in same st as ch 3, dc in ch sp, dc in dc, continue making dc’s in each stitch and ch 1 sp until you reach the center ch 2 sp, 2 dc, ch 2, 2 dc in ch 2 sp, continue making dc’s until end of row, making 2 dc’s in the 3rd ch of the ch 3 from previous row; turn. Repeat Repeat Rows 7 – 12, six times. Lay piece flat in front of you with whichever side you would like to be the front. Position so that the flat edge is at the top, and the triangular portion is towards the bottom. Ch 1, (ch 1 does not count as st) make 3 sc in corner stitch that you are currently in and sc across top edge, making 2 sc per row; in top center stitch make 1 dc; make 3 sc in second corner. I had approximately 187 stitches (not counting my corners) along my top edge – this doesn’t have to perfect! Sc in each st along triangular bottom, making 3 sc in the center ch 2 sp. Join with 1st sc of round using a sl st. 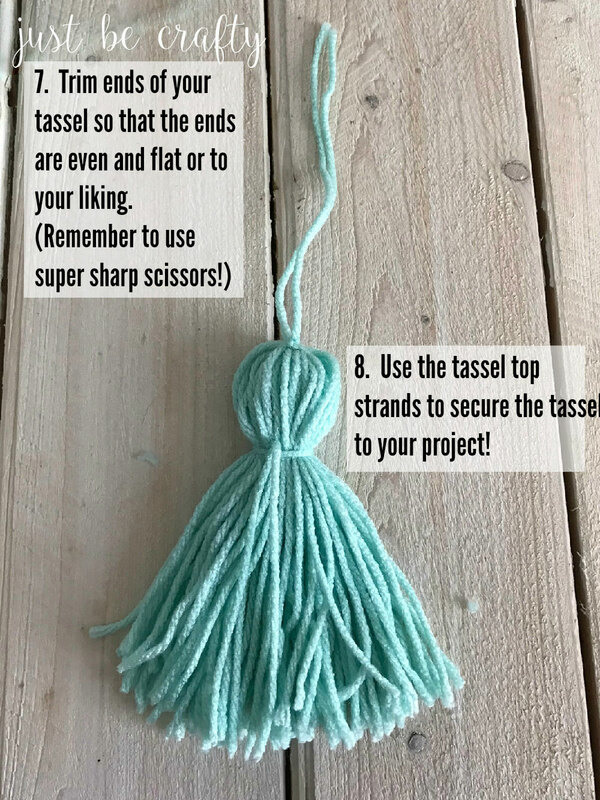 Tie tassels to each corner of the scarf and secure. Weave in any ends. 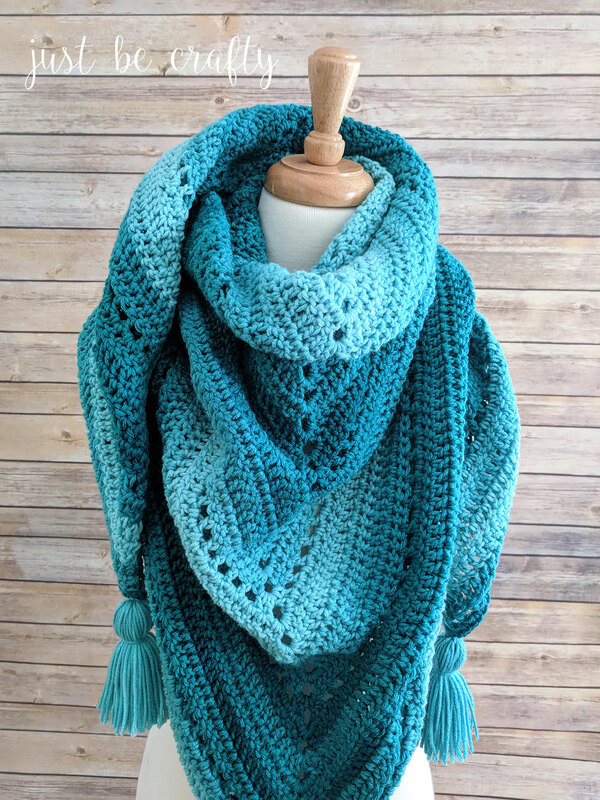 Where can I download this pattern from. Hi Mick! There is currently not a downloadable version of this, but I plan to make it available soon. Thank you for the well explained pattern. 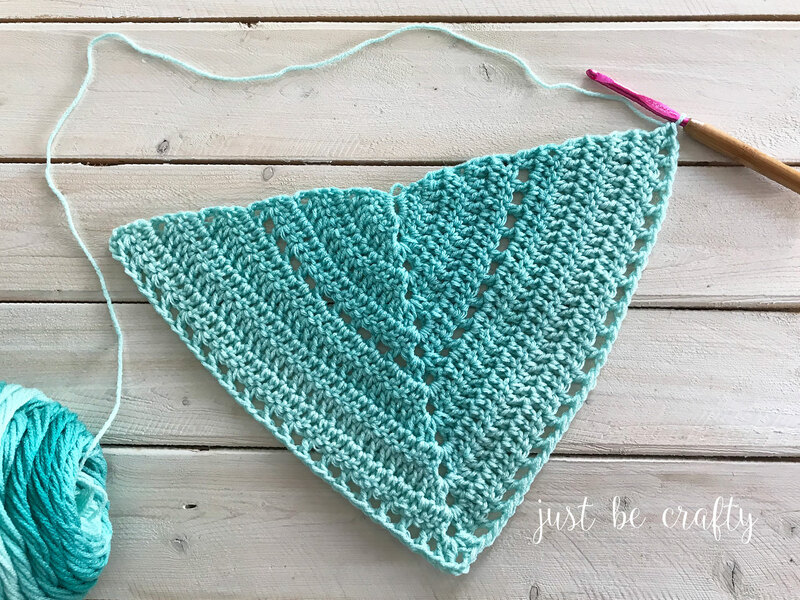 Hello- I am trying this as my first triangular shaped shawl and I was wondering about stitch counts for each row. Do you have that available? Mines turning into more of a kit shape and am wondering if I have been missing some stitches at the ends of each row… Thank you! Hi Nikki! If I remember correctly – mine looked more like a kite shape for a while too until it got much bigger. Row 2 ends with 18 stitches, and in each row you are adding 6 stitches. Thanks for this count info. Perhaps I can find where I’m either adding a stitch or need to add. It’s a simple pattern and yet I get a stitch off. Ugh ? What ply wool is this equivalent to in Australia. In the blog it says uts 4ply but in Australia 4 ply is mainly used for baby clothes and in the photos the yarn looks a lot thicker. Hi Lorraine! 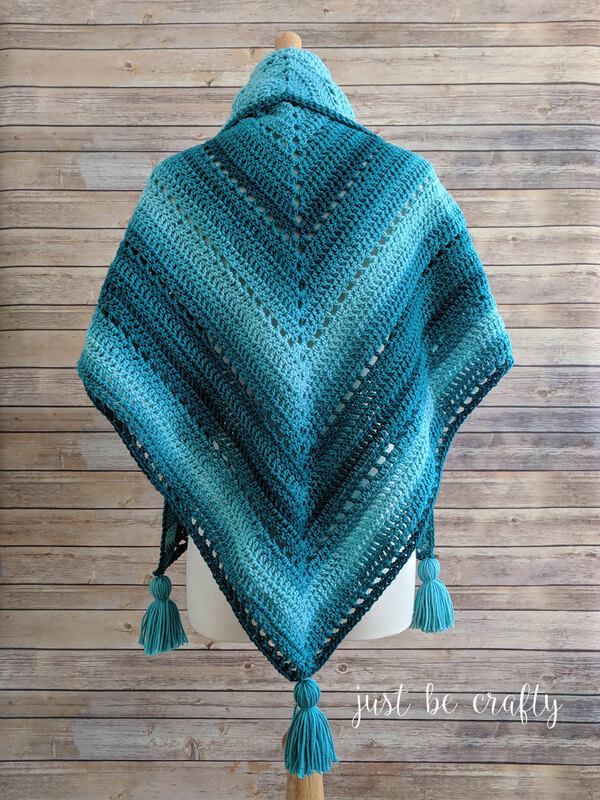 I am not sure of ply equivalents between the US and Australia but if you check out the materials section of the pattern I share a link to the yarn I used. 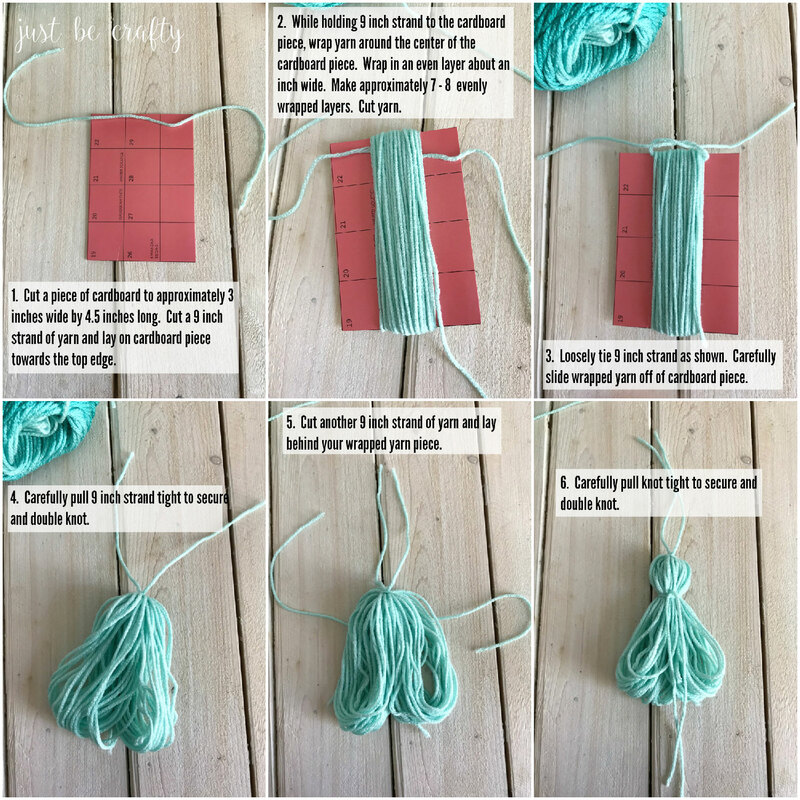 That link should show all the information about the weight and thickness of the yarn. It’s 100% acrylic and worsted weight. I hope this helps! I think some confusion re stitch count may happen w row 7. After a closer look on the picture, I totally agree with you, there is a dc in the second (and second to last) dc of row 6, so that the row ends with 48 DC + ch2 space. I’m happy to notice it before I start, thanks ! I’ve finally done crocheting it! It turn out big on me but I still love it! I’m using cotton yarns with 5.5mm hook. Next time I will use a different yarns and hook. 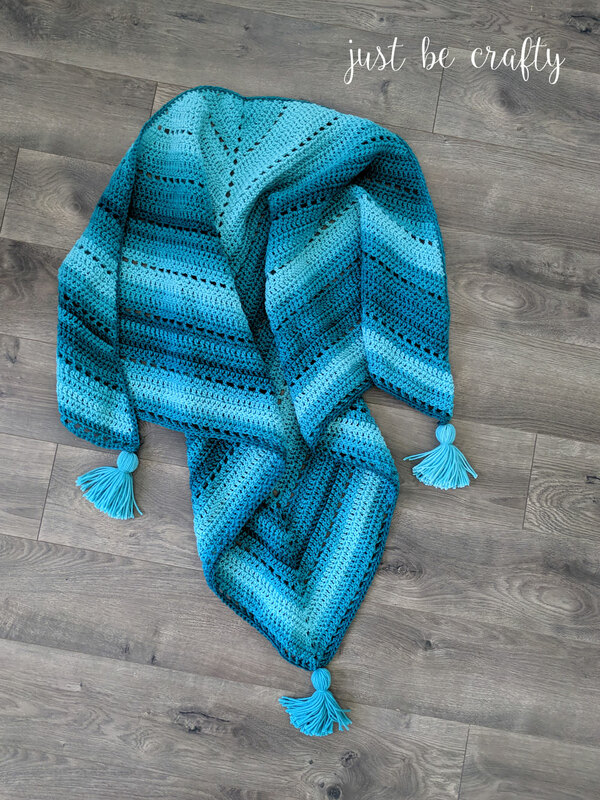 Btw it’s my first crochet shawl that I crochet for myself. Also your pattern is easy to follow! Thanks for the pattern. thanks for sharing this pattern! 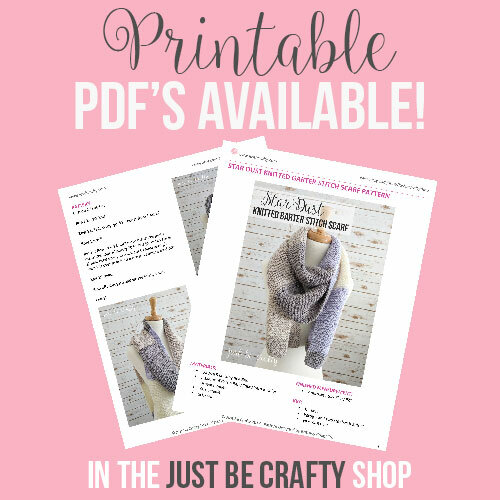 I especially love your chunky cowl crochet pattern. 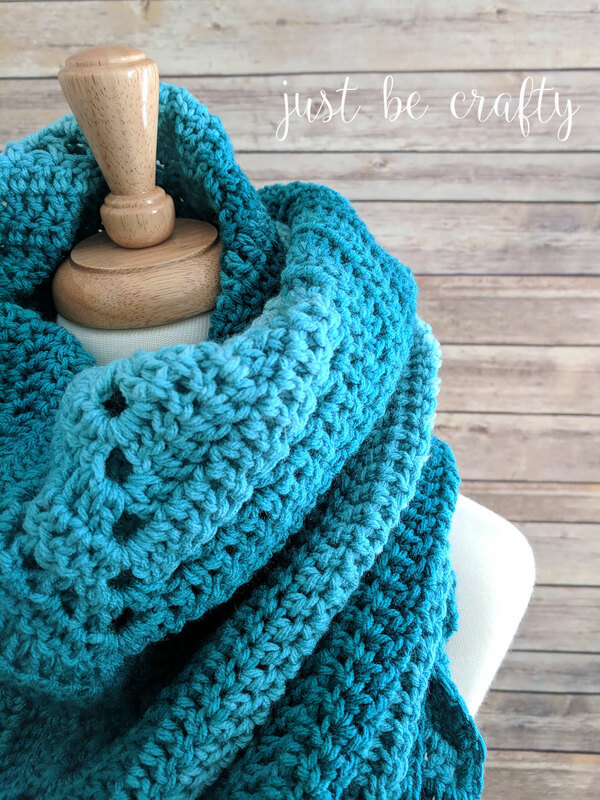 I love cowls as you don’t have to worry about them slipping off my neck or tying them. But I will try this pattern for holiday gifts. thanks again for sharing! Yes, I believe clarification of a few things in this pattern would be very helpful to people. I figured it out and it was super easy!!!!! Now I’m making more in other colors! Thank you!